Stranded first caught my eye because of its gorgeous, haunting cover. Then I read the synopsis and I was totally hooked! I don't read much adult fiction, but when I do it's usually horror or survival stories. This one was an incredible mix of both that kept me on the edge of my seat from start to finish! This story is about Noah, a Merchant Mariner who is literally having the worst luck. He's a deckhand stuck with a captain who just happens to be the father-in-law who actually hates his guts. The past year has been incredibly rough for him, at home and at work, and now his ship also happens to be heading into some really weird weather. Noah was an extremely sympathetic character who I just wanted to succeed and come out okay. Fun fact about me: my husband is a Merchant Marine and this added to my feelings of sympathy towards Noah. I know how difficult the job is in the best of times and this poor, poor guy just could not catch a break. 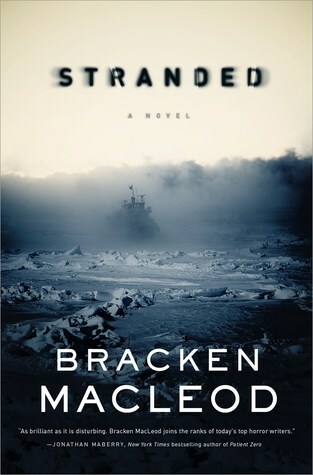 Stranded is literally about a ship being stranded in the middle of nowhere - in the middle of a sea of ice, to be exact. The ice is way thicker than it realistically should be and it's difficult not to panic right along with Noah when the crew realizes none of their equipment is working, with no apparent cause. Even worse, the entire crew seems to be sick (other than Noah). With no way to call for help and with physical and mental capacities failing, Noah is unwittingly thrown into a position of leadership in an attempt to find help. I felt like I was in The Twilight Zone (one of my favorite shows of all time) reading this book and it was amazing. There isn't much I can say about the plot without giving too much away, but Stranded is an absolute roller coaster. There were moments I was shocked into putting the book down and staring into space for a minute, trying to wrap my mind around it all. The not-quite-right atmosphere of the icy landscape added to the sense of unease I had throughout the story and I loved it! Towards the end of Stranded everything unraveled a bit for me. The characters became more volatile and the action definitely picked up, but this kind of book doesn't necessarily need a ton of action, in my opinion. It was much more unsettling when the characters were just trying to figure things out. I also didn't love the ending and didn't like that there really wasn't much to explain what had occurred. I can understand why the author ended things the way he did, but I would've appreciated at least some kind of answers. Overall I really enjoyed Stranded! It was a thrilling ride and I loved that it kept me guessing. This isn't the kind of horror I usually gravitate to and there weren't any real scares, but I will say that it made me feel more uneasy than most of the horror books I've read this year.